Today Tonal, the first-ever personalized, digital-weight system with interactive video workouts powered by machine learning, announces the opening of its first physical showroom at 1824 Union Street in San Francisco. The showroom is available from Wednesday to Saturday at 11am to 7pm, Sunday at 11am to 6pm, and Monday to Tuesday by appointment. Walk in at your convenience or visit tonal.com to book a full workout and feel what Tonal can do for you. The new flagship store is conveniently located in Cow Hollow, where you can meet Tonal’s expert coaches and experience a hands-on, personalized demo of the product. You can even find out how strong you are with a Baseline Strength Assessment, or break a sweat by trying the free Intro Workout. 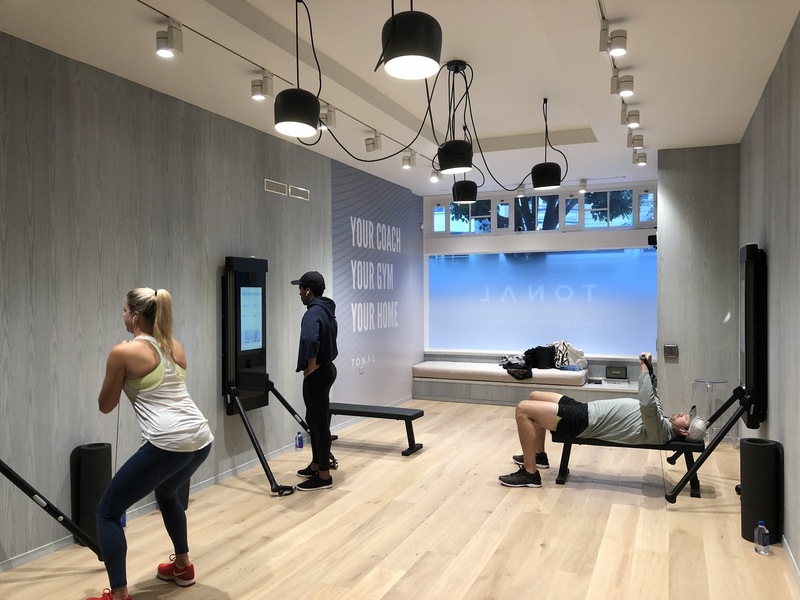 Tonal and its new showroom channel the neighborhood’s polished and upscale atmosphere: designed to be sleek and compact, the wall-mounted strength training system combines on-demand personalized coaching with digital weights. That means no bulky gym equipment in your home, and certainly not in the showroom. Created by a team of consumer hardware and software experts, fitness professionals, content producers, and brand builders, Tonal is like having a personal trainer and an entire gym in the convenience of your home. As the first intelligent strength training system with digital weights, Tonal offers hundreds of hours of expert coaching through step-by-step video workouts that guide and motivate you, while machine learning adapts workouts to you and challenges you to meet your health and strength goals. Tonal’s all-in-one equipment features digital weights that pack 200 lbs. of resistance into a compact strength training machine. Using an electromagnetic engine and two adjustable arms, Tonal provides the first connected strength training experience made possible by advanced intelligence. Tonal allows you to measure your baseline strength, set your fitness goals and continually adjusts to the right weight for you. Then, it recommends the ideal strength programs and workouts based on hundreds of hours of elite coaching that are updated daily. For those who prefer designing their own workouts, Tonal’s freelift mode provides you with the ability to strength train at your own pace. With Tonal, you are able to systematically see your progress and review your stats in real time. It also adjusts your workout programs based on how your strength builds over time. Using machine learning, Tonal’s digital weights even measure and respond to you as you work out, automatically adjusting the weight if it senses you are struggling to complete a rep. Strength training is foundational to everything we do, be it everyday activity, weight loss, or athletic performance. However, this type of training is often daunting even for the experienced, and not designed to fit in homes -- until now. Tonal’s streamlined, wall-mounted system provides personalized expert-led programs around your schedule and goals, incorporating strength, flexibility, and intervals to curate the ideal workout. The Tonal system retails for $2,995 with a content and data subscription for $49 per month, available for unlimited users per household. Tonal has partnered with Affirm to offer combined monthly financing payments as low as $175 for the equipment and subscription, competitively priced relative to elite gym memberships, legacy equipment, and personal training. To learn more and stay up-to-date on community workouts, coaching sessions, and partnership events hosted at the newly launched Tonal showroom, sign up at tonal.com.